Smart camera maker Arlo has announced a new DIY security system at CES 2019 that will keep your home safe from pretty much any threat you can think of. The Arlo Security System features an all-in-one Multi-Sensor that detects windows and doors opening and closing, motion, smoke, carbon monoxide, water leaks, the sound of gas leaks, temperature changes and more. If anything at all changes in your home, you’ll be notified immediately though the Arlo app on your phone. Arlo’s Security System also includes the Arlo Siren, which is battery-operated and suitable for use outdoors. Position it anywhere within range of the Smarthub, and it will frighten would-be intruders with a red strobe light and blaring alarm. If you’re feeling a little more subtle, you can replace the siren with other audio (such as a dog barking or TV noise) to give the impression that you’re at home when someone approaches your front door. Although you can control every aspect of the Arlo Security System through the app, you can also arm and disarm it with a press of a button using the Arlo Remote. This controller also features programmable buttons for actions like turning on lights, or activating the siren (or faux dogs) manually. 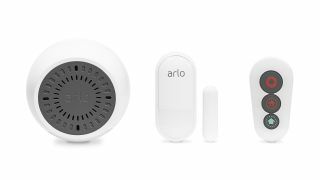 The company has yet to announce any pricing, but the Arlo Security System will be available to buy in the second half of 2019.